BP Locksmith, Locksmith Barnstaple, North Devon. ALL YOUR LOCK PROBLEMS SOLVED! Domestic & Commercial Locksmith, North Devon. 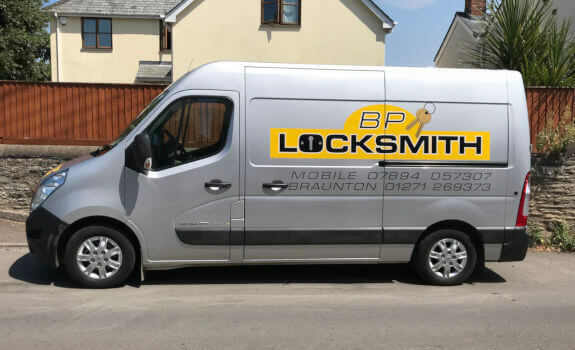 Whether you're locked out of your home, workplace or vehicle, need your home / office security reassessing, or need help after a break in, you can rely on BP Locksmith to provide you with a quick, reliable & caring locksmith service. Many people will need the services of a locksmith at some point in their lives - your security is not something you want to leave to chance and it's important to choose a professional that you can rely on, especially in an emergency. BP Locksmith is a genuine local business (not a call centre!) based in Braunton and covering the whole of North Devon. Our City & Guilds qualified Locksmith has many years experience dealing quickly and sensitively with a wide variety of home and office security related issues. Locksmith Services in Braunton, Barnstaple. To find out more about our Locksmith in Barnstaple, North Devon services please click here. just call George Peacock on: 01271 269373 or: Mob: 07894 057307.